After 40 yrs on Main Street in Historic Ellicott City, we will be moving to a new location, we are currently building not far from the Historic District. We will no longer have the option of walk in, so you must call to set up an appointment, 410-461-9336. Our hearts will always be in Historic Elllicott City, but we are excited about our new chapter. 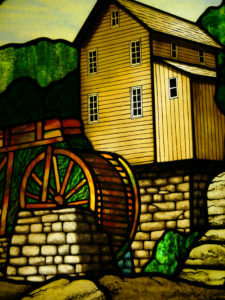 Great Panes was established in 1980 in historic Ellicott City, Maryland, by Len Berkowitz. 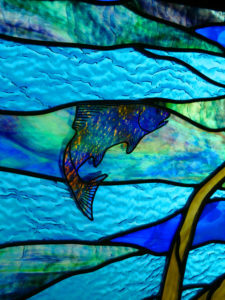 Great Panes is best known for its one-of-a-kind decorative glass designs. As of today we have produced over 2,500 signed pieces that have been shipped all over the world. 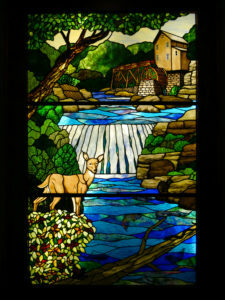 We specialize in leaded stained glass, hand-painted glass, etched and carved glass, hand-beveled glass, fused and slumped glass. We work with builders, architects, interior decorators,homeowners and churches to produce custom pieces based on their theme or style. Great Panes also has extensive experience with glass restoration. We restore decorative glass for homes, churches, schools and commercial buildings. We’ve done numerous large-scale projects for buildings on the National Register of Historic Places, including the Maryland Governor’s mansion, the B&O Railroad building in Baltimore, and Baltimore’s Northern District Police Station, and the Congressional Country Club. We also did 12 Victorian Floral etched mirrors for the American History Smithson. We work with clients in Baltimore, Washington, D.C., Pennsylvania, New Jersey, Delaware, Virginia, and nationwide.